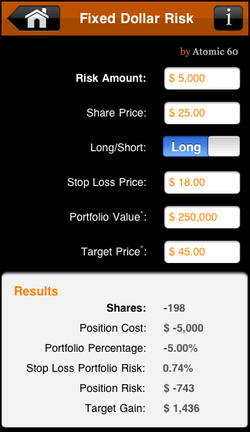 "Fixed Dollar Risk is a Stop Loss based risk Calculator"
Fixed Dollar Risk determines the amount of shares to buy based on your Risk Amount and Stop Loss. Your Risk Amount is the most important factor. When you enter your Stop Loss Price, the number of shares to buy will adjust so that your risk is never exceeds your risk amount. I am willing to risk $10,000. ABC share price is $25.00. This is a Long position. My Stop Loss Price is $20.00 Portfolio Value is 1,000,000 and broker comm. is $6.99. Based on this, I can buy 2,000 shares. 1.0% of my portfolio value is at risk. This position account for 5.01% of my portfolios' value.